Everyone’s all abuzz and atwitter about Plus, the new social network from a search engine company with which you might be familiar. I won’t break down all the features and how-tos and what-ifs, as other folks are better at that, including Jason Falls and Chris Brogan. My initial, abbreviated take is that Google’s new social toy is essentially a Facebook Twitter hybrid with outstanding ease-of-use and eye-popping potential. In the very first release, Plus has a killer integration with Picasa (Google’s photo service), and its live video chat feature (called Hangout) could very easily become a Skype killer. The most obvious and ballyhooed functionality is the Circles paradigm, which puts segmenting your contacts front-and-center and makes it an easy process via drag and drop controls. No slaving over list creation (Twitter), or slogging through the mine field of clicks and sketchy instructions for creating your own groups (Facebook). Plus makes it exceedingly simple to put your friends in one category, your co-workers in another, etc. 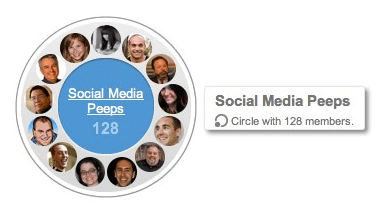 Already, some early Google Plus users have created 20 or more Circles to categorize their online relationships. 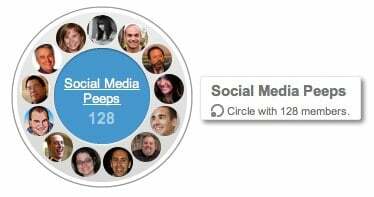 Publishing your status updates, photos, videos, et al to one or more of these Circles is a one-click exercise in simplicity. But enough about that. You’ll be playing with it yourself soon enough, and drawing your own conclusions about how Google Plus fits your own idea of social connectivity. I instead want to focus here on when Google Plus/Google + (jury is still out it seems) will become viable for company usage, and how it might impact Twitter and Facebook social outposts. Categorizing and cataloguing the vast World Wide Web has been the white whale of computer scientists for decades. Google has cracked this code the best – at least in commercial terms – and they continue to tweak their search algorithm daily, with major updates several times each year. However, even though Google is pretty damn good at figuring out what’s good and what’s less so on the Web, their entire outlook historically been rooted in two key components: the page and the link. Pages have been the basic building blocks of the Web since the advent of HTML, and sending out armies of robots to read and sort them accurately is an overlooked but incredibly important element of daily online life – like electricity or LOLcats. Long ago, search engines recognized that any idiot could write “discount auto parts” 37 times on a Web page, and try to get ranked #1. Thus, in addition to thousands of other improvements to the ranking mechanism, Google devised its PageRank formula that uses the number, type, and reputation of other Pages that link to your own as a major ranking factor. At that point, search engine optimization coalesced to become a form of geek chess, where SEO pros compete daily against Google’s own stable of geeks, playing a high stakes game of loophole discovery, exploitation, and elimination. It’s like Spock playing 3D chess, but with Red Bull and multiple monitors. The game is about getting your Pages ranked based on the words they contain and the other Pages that link to them. And this made sense for about a decade. A lot of sense. Amazingly, Google made hundreds of billions of dollars by charging people to circumvent its own technology, charging a fee to put your Pages first (or adjacent), even if they didn’t deserve it based on the ranking formula. But when social media soared, and we discovered our deep and near-universal desire to combat an increasingly fractured society by sharing tiny snippets of our lives, the notion of the Page and Link being the coin of the realm started to feel as quaint as a car hop. Today, far more status updates, photos, videos and other social flotsam and jetsam are published and shared than fully formed Web pages. That’s because content creation is now about small stuff, not big stuff, which makes it is no longer a commercial enterprise, but a personal one. I started online in 1994, and while there were certainly millions of personal Web page creators on AngelFire, Tripod, AOL and other early Web publishing venues that were the cro-magnon precursors of WordPress, the number of netizens using these tools was exceedingly small compared to today’s 73% of Americans with an Internet connection who visit Facebook each month (Comscore). And that huge shift away from Pages and toward smaller pieces of sharable content (“Edges” in Facebook’s parlance) created a major problem for Google, whose empire is built on the primacy of the page, and the latticework of connections between them. 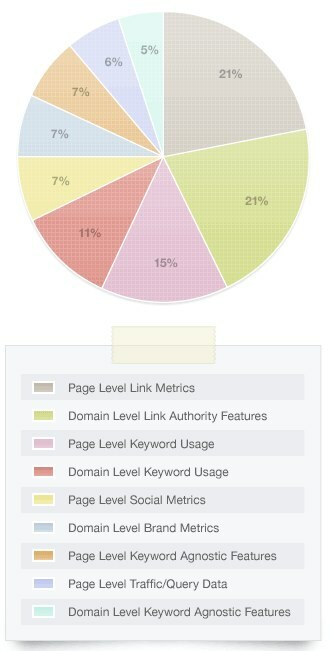 PageRank was devised to provide for Google users the best possible search engine results. Philosophically, Pages with more and better other Pages linking to them must be better content, and each link counts as a “vote” for that Page. But when the dominant form of expression became something smaller than a Page, and our votes of content confidence became expressed by social sharing and other behaviors that differ from “I’m going to link to this website from my website” Google found itself trying to play web page ranking poker with less than a full deck of cards. It was trying to do a very difficult job with incomplete information. While they realized it too late, they did in fact grasp this shift years ago, which is why Google tried so hard to purchase Twitter when it was still in its infancy. Google realized that whether or not Twitter ever made real money, its true value was as a scorecard for ranking social content. Each RT and follow counts as a vote in the post-modern confidence game of content sorting (as does your own historical propensities, your geographic location, and other things that can be vaguely creepy). 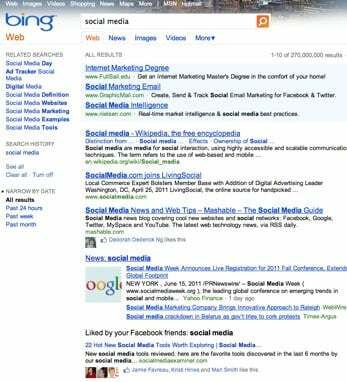 And while Google wasn’t able to buy Twitter, they were able to incorporate Twitter data into Google results, and the tweets and mentions your published content receives has a material impact on how Google ranks you (which is why search and the marketing side of social media are important to consider in parallel). Further, if you are signed in to Google.com, your search results may be impacted not just by what happens on Twitter, but by what the people you follow are doing on Twitter. (NOTE: Since I posted this on July 3, I learned that Google has acknowledged their special feed from Twitter expired July 2. This makes the timing of the G+ launch particularly interesting). Facebook, however, is a different story. They’ve been wary of Google forever, because they realize that this shift away from Pages and toward social objects puts the platform where those objects are most-often created (theirs), at a distinct advantage over all others. Facebook has never opened its data stream to Google entirely, choosing instead to partner with Microsoft’s Bing to launch a relatively tepid and non-threatening social search product that pulls the Facebook behaviors of your friends into your Bing search results if you authenticate using your Facebook credentials. Meh. This leaves Google with more “social signals” to bake into their search algorithm than they had originally – because they have Twitter data – but Twitter is used by just 8% of the U.S. and Google isn’t in the 8% business, it’s in the “we’re taking all the marbles, and the sack they came in, and you might as well give us the chalk you used to draw the circle while you’re at it” business. Consequently, Google has tried to invent a source of social signals to give it the scoring information it needs to stay on top of the relevancy heap in an ever-expanding Web. Orkut. Google Buzz. To some extent Google Wave. Picasa. None of them got even Twitter-level traction, much less Facebook. There are a lot of reasons for these failures, but chief among them is that Google has historically tried to lead users down a new path of social behavior. Wave in particular was an amazing technological advance, but required such a fundamental change in how you interacted with others via a computer that it was simply a bridge too far. Wave, like many of Google’s social products, was the answer to a question that we were not collectively ready to ask yet. But with Plus, Google has completely reversed course. At present, there are very few elements of Google Plus that are unique. Instead, they are Facebook and Twitter features that are done with a level of grace and forethought befitting a huge, experienced company with third-mover advantage. Facebook is essentially the world’s biggest on-the-job-training program, with a bunch of brilliant but somewhat inexperienced people trying to build a monstrous castle by remodeling one room every day, while 750 million people are staying over for the weekend. It’s batting average on new features suffers accordingly. 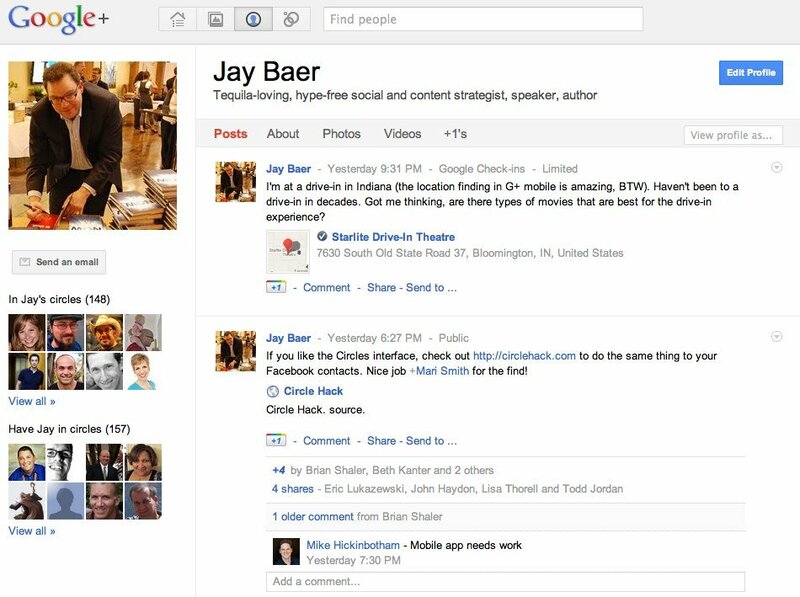 From a software perspective, at launch Google Plus feels nearly as mature as Facebook does today, after 10 years of development. This time, Google swallowed its considerable “we can do this different” pride and instead took the best of Facebook and Twitter and simply did it better. True, Facebook has social content creation and social signals that can be used to rank Web pages, and Google doesn’t yet. Conversely, Google has all the traditional ranking data, an enormous customer base via Google AdWords, and a suite of complementary products that’s so large it’s sometimes easy to overlook. Recognize that Google actually owns the first AND second biggest search engines in the world, since YouTube is currently #2. There is no question in my mind that Google will very quickly (if they aren’t already) begin incorporating Google Plus behaviors into the ranking algorithm for Web pages. And while they’ve denied it in the past, there’s a history of Google ranking pages created on its owned platforms advantageously. Google Knol, for example. Google has an operating system (Chrome), a browser (Chrome), and the leading mobile platform (Android). Facebook has none of these, and Twitter has essentially nothing at all other than Twitter.com, a bunch of celeb and jock users, and Tweetdeck – for which they inexplicably paid $40 million. I’ve written before that Facebook wants to become the plumbing of the Web, but Google already owns more pipes, and has more plumbers and customers. While Google hasn’t rolled out Plus pages for business yet, they have acknowledged they are on the way, and enterprising companies like Ford and Mashable have already cobbled together presences there by co-opting personal pages. Here’s the scenario I see unfolding before the end of 2011, and possibly before Labor Day. Google opens up business pages on Plus to Adwords customers. Any clicks and +1 (Google’s version of Facebook “like”) your business content receives on Plus has a direct impact on your organic search engine rankings, while your Facebook activity continues to have no impact. How do you feel about Google + then? Certainly, if consumers don’t flock to Google + then businesses will continue to put many eggs (too many in most cases) into their Facebook fan pages, in an attempt to be where their customers are, and their Google + presence will be a secondary concern. But if Plus gets any sort of real momentum among end-users – and I firmly believe it will – Google’s unique ability to finally tie search and social together in one package will force the hand of business, making Google + the place to be for interaction between companies and their customers. I’m not predicting the death of Facebook (or even Twitter), but smart companies will spend some time this summer making sure they’re focused on how to BE social, and not how to DO social on a particular platform. Because eventually, the tools always change online.